As book doctors, we have the privilege of traveling all over the country and connecting with organizations that help writers get successfully published. We’ve been hearing about GrubStreet for years, and when we started investigating, we found out what an amazing organization it is. So when we discovered that Katherine A. Sherbrooke, GrubStreet’s board chair, was coming out with a new book, Fill the Sky, we thought we’d pick her brain about writing, writers groups, and the joys and perils of switching from memoir to fiction. The Book Doctors: We understand you’ve always wanted to be a writer since you were a kid. Why in God’s name would you want to be a writer? Katherine A. Sherbrooke: I suppose in the same way a kid watching the lunar landing decides they want to be an astronaut, or the way the 1980 Winter Olympics spawned legions of hockey players. Witnessing something extraordinary makes you want to do it. Reading books transported me in that way. Plus, I’m claustrophobic and afraid of heights, so space travel was definitely out. KS: I vividly remember being mesmerized by James and the Giant Peach, and The Lion the Witch and the Wardrobe, I suppose in part because they opened my eyes to the power of imagination combined with ink and paper. One of my all-time favorites had to be The Velveteen Rabbit. Its metaphor of fraying fur and missing buttons as proof of love, of being real, moved me deeply. TBD: How did you learn the craft of writing? KS: I was blessed with incredible English teachers in my early days, and built a strong foundation for writing through (don’t laugh) diagramming sentences until I was blue in the face, and later learning the art of a well-written essay and the importance of good structure. While that gave me a certain confidence with the written word, creative writing requires a whole added set of skills. The first teacher was good novels, reading a lot of them. The rest I learned at GrubStreet, mostly getting feedback on my work from other writers so I could hear first hand what techniques were working and which ones weren’t. TBD: Tell us about GrubStreet and your involvement with it. What have you learned about writing and writers from being involved with this organization? KS: GrubStreet is one of the largest creative writing organizations in the country, open to writers of all levels. It is an organization that believes deeply in the power of narrative to transform us as humans, and the desperate need for us to hear stories from all walks of life, a mission very close to my heart. So I fell in love with them from the minute I walked in the door and immediately wanted to help. From a writer’s point of view, I describe GrubStreet as the lifeline of my creative pursuits. Many people think of writing as a lonely endeavor, and I suppose the actual act of sitting down and putting thoughts on paper can feel that way, but there is much more to the process than that if you are willing to give and accept help. I have found the most incredible community of writers at GrubStreet. This is a group of amazingly talented and generous people who truly want to help each other succeed. I have learned everything I know about what it takes to actually complete a novel and get it out into the marketplace through classes, conferences and the community at Grub. TBD: You’re also an entrepreneur. We are too. What did you learn about being a writer by inventing and running a business? KS: My co-founder of Circles used to say that there is a fine line between entrepreneurs and mad men: they both see things that aren’t there. Writing is the same. You have to believe that what you have to offer has a place out there in the world, even when it’s not finished, even if it doesn’t fly off the shelf at first. Entrepreneurship, in my view, takes a whole lot of really hard work, a good measure of luck, a legion of people keen to help the project succeed, and a willingness to take a deep breath and fling yourself off the cliff. Trying to get a book out into the world isn’t much different. Or maybe I’m still just crazy. TBD: Your first book was a memoir, and it was about your family. After David’s memoir came out, his family didn’t speak to him for five years. What were some of the dangers and joys of writing and publishing your memoir? KS: My parents had a classic, tumultuous love story leading up to their marriage that they would occasionally indulge me or my siblings by telling. We had each heard different snippets, but none of us had all the detail, all the various pieces. When my mother was overcome by dementia, I realized that I had to sit down with my father (who thankfully has an iron-clad memory) and get the whole story on paper before it was too late. The best part were the hours of conversation I had with my dad about his younger days, including touring through every corner of Newark, NJ with him to set the scene: where he grew up, his high school, his father’s old tavern, where they went on dates, etc. I walked away with much more material than fit in the book, but they were conversations I might never have had without that impetus. On the flip side, handing my own version of my parent’s love story back to my father to read was terrifying. Thankfully he loved it. He emails me all the time to tell me he stayed up all night to read it again. TBD: How was it transitioning from writing non-fiction to being able to make stuff up and create a novel? KS: Really hard! As restrictive as the requirement to stick to the facts felt at times while I was writing the memoir, I was handed a great cast of characters, a fantastic plot, and a setting that I didn’t have to invent. I added a little research to corroborate what my father had told me, and voila, my book was born. When I turned to fiction, having absolutely no boundaries on any of that made the process much harder, and take much longer. That said, it is really satisfying to have a new plot point or a new character pop into my head while I’m out for a walk and suddenly know that my story has taken a turn for the better. And having the license to explore through fiction things that have never actually happened to me is pretty amazing. 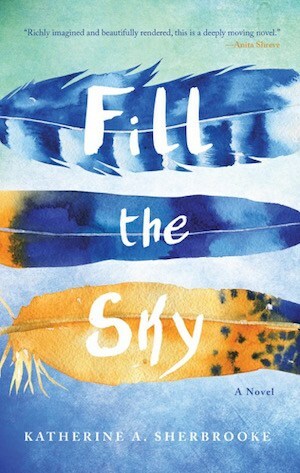 TBD: What was your inspiration for your new novel Fill the Sky? KS: I love reading books that take me to a place or time I have never been to so I can learn through the ease of a great story. I was beginning to hunt around for a book idea when I happened to go on a trip to Ecuador with a group of friends to spend some time with local shamans. The trip was a life-changer for me, and it struck me as an incredible and unique setting for a novel. The premise is fictional (we didn’t travel there for health reasons) but all the rituals in the book save one are things I have actually experienced. KS: I’m at work on another novel. Stay tuned. KS: Find trusted readers, people who are willing to read your entire manuscript and give you honest and detailed feedback. They do not have to be writers; in fact, some of the best input can come from avid readers. But don’t just do this because you want applause and adoration. It is really important to be open to their feedback. It can be very hard to hear that a scene that had you weeping while you wrote it barely registered with your reader, or that your favorite character leaves them cold (and you may need several days or weeks to process what they have to say), but that is precisely the kind of input you want. I find it very hard to see my work for what it is without the guiding hands of intelligent readers. They are worth their weight in gold. Katherine A. Sherbrooke received her B.A. from Dartmouth College and M.B.A. from Stanford University. An entrepreneur and writer, she is the author of Finding Home, a family memoir about her parents’ tumultuous and inspiring love affair. This is her first novel. She lives outside Boston with her husband, two sons, and black lab. Visit her online at www.kasherbrooke.com, Facebook, or Twitter.